I recently received a comment asking about the management of guinea fowl hen sitting on her eggs and the keets that hatch out. We have a guinea fowl in our garden who has been sitting on her eggs for a long time now and some of them hatched this morning. We built a shelter around her from wire and she hasn’t moved from her nest. Do you think this will be ok for the keets to survive? Does she need to be able to get on and off the nest and wonder around; or do we need to leave food in the enclosure for her and her keets? 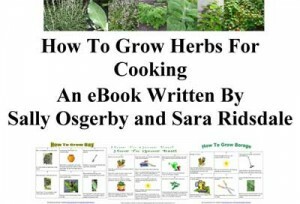 Thanks for contacting farmingfriends and telling me about your guinea fowl. Congratulations on the hatch. Your guinea may not have moved because not all the eggs may have hatched yet and she will be waiting for the others to hatch. Make sure that the shelter is predator proof and has an area where the keets can shelter from the elements (wind, rain or snow!) Also make sure that the wire is small enough so that the keets can’t get through the wire or rats can’t get in as rats, mink, stoats would get in and kill the keets. I would make sure that their is food and water in the enlosure. The keets will need chick crumbs and make sure that they cannot drown in the drinker, I usually add marbles or pebbles to the drinker so that the keets can still drink the water but can’t immerse their head in it. Sitting birds may come off the nest once or twice a day to drink, eat and stretch their legs but if she is in the final stages of sitting then she may not. Once all the eggs have hatched or the guinea fowl leaves the nest and the remaining eggs are not going to hatch the the guinea fowl should show the keets how to drink and feed although they will do this instinctively if the food and water is placed close enough to them. I hope all the hatchlings are doing well and that the rest hatch soon. Keep me posted. Where in the world are you? I am based in Yorkshire in the UK. 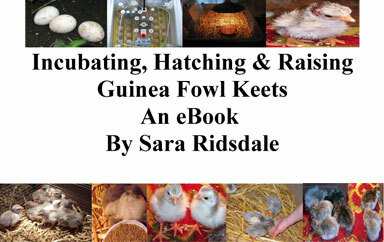 I have also written an eBook about incubating, hatching and raising guinea fowl keets, it mainly discusses incubating the eggs in an incubator as opposed to a guinea fowl hen sitting but also discusses raising the keets to 6/8 weeks. 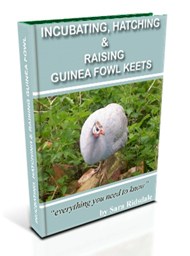 If you have any advice for Bob about a sitting guinea fowl and then raising the keets with the guinea fowl hen then please leave a comment.